Most of the time, I like sketching outdoors in the fresh air. Recently, however, I discovered the joy of sketching in the car (don’t worry, I wasn’t driving!). 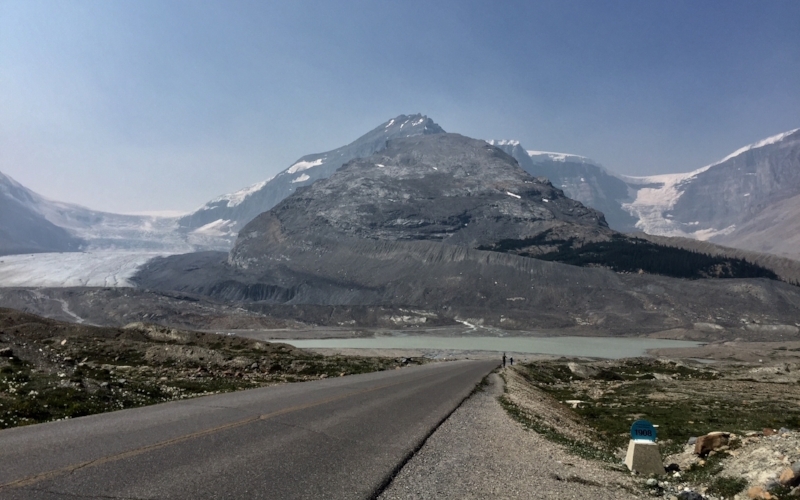 We were driving along the iconic Icefields Parkway, a 144 mile drive between Jasper and Banff in Canada, famous for its stunning views mountains and glaciers. We stopped regularly to take photos but I wanted to capture the sheer abundance of stunning views in between our stops. So I got out my sketchbook and started doodling from the passenger seat. The scenery changes so rapidly when you’re in a car that it’s pointless trying to sketch anything too large or ambitious. But by creating a series of little thumbnail sketches — each individual sketch is very small and only composed of a few (wobbly) lines — I ended up with a personal and evocative record of one of the best car journeys I’ve ever been on. Give it a go next time you’re a passenger on a long drive. Car doodles are fun and can help you appreciate the landscape in a whole new way.